Myth: Ferdinand Magellan (Fernão de Magalhães) was the first person to circumnavigate the globe. There's no doubt that Magellan intended to have a successful journey when his expedition set off from Spain on September 20, 1519. If Enrique Malacca remained alive and on good terms with the natives, given that all that remained for him to return home was a month or two of island hopping- and he would have been well aware of this- many historians think it likely he may have returned home. If he did this fairly soon after his escape, he definitely would have beaten the Europeans home, as he was left on Cebu on May 1, 1521, about 15 months before the expedition would make it back to Spain. Elcano guided the Victoria and the Trinidad to the Moluccas by late fall 1521, where the ships were loaded up with as many spices as they could carry. The Trinidad's captain and crew decided to stay in the Indies to repair their ship, while Elcano in the Victoria elected to head for home. After briefly being interned by the jealous Portuguese, who suspected that the Spanish-flagged Victoria was up to no good, the vessel (and 22 survivors) limped into the Bay of San Lúcar in Spain on September 6, 1522. The better documented honorees seem to be the few remaining crew of the Victoria and its captain, Juan Sebastian Elcano. 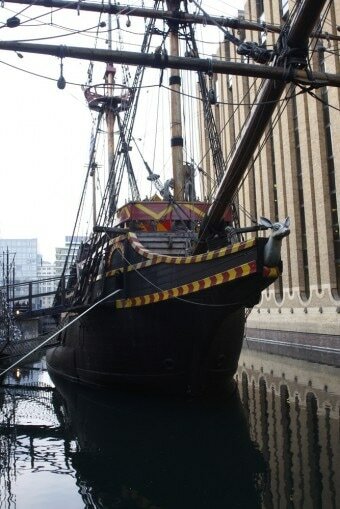 This ship was the only vessel from the expedition to return to Spain after their trip around the globe. It landed on September 6, 1522 about three years after their initial departure, with just 18 men on board out of the initial 241 or so that set out on the journey.